1 Cook the noodles according to pack instructions. Heat a wok over high heat and add the oil. When the oil starts to smoke, add the garlic, ginger and chillies and stir fry for a few seconds. 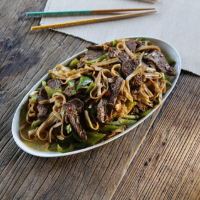 Add the beef slices and stir fry for 1-2 minutes, keeping the ingredients moving in the wok. As the meat starts to brown, add the rice wine. 2 Add the green pepper and stir fry for 1 minute. Add the noodles, breaking them up with a spoon, then add the soy and black bean sauce and stir everything together. Garnish with the sliced salad onion and serve. This recipe was first published in Thu Apr 03 11:20:00 BST 2014.